It’s fair to say that this blog has somewhat taken the piss out of James Haskell from time to time – and the fact that he has been more than happy over the years to put his “Brand Haskell” head above the parapet does make him something of an easy target. As his career has progressed, however, and with his renaissance as an international rugby player under Eddie Jones, there is little doubt that both this blog and the English rugby public in general have warmed to The Hask and I fear he’s right when he states that the game is beginning to run out of characters like him. 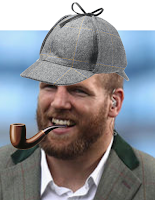 As if to emphasize the point, Haskell’s girlfriend, Chloe Madeley, has apparently recently let slip that the England flanker is obsessed with Sherlock Holmes and has written a novel which he plans to publish when he retires.